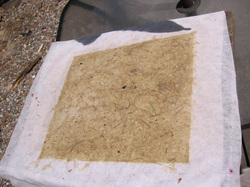 I make paper out of a variety of local plants, more standard paper making materials, and recycled materials. I can make paper for your event in many colors and sizes, by hand, to give you exactly what you're imagining. I enjoy every step pf the process, starting with taking a walk and cutting plants, to cooking them, to turning them into pulp, and finally making paper out of them. I use a handbuilt press and everything is done in my studio. I have taught papermaking classes at Aristocraft Studios in Flagstaff, Arizona several times, and have made paper that has been sold at many local shops. I have made paper for wedding invitations and other projects. I am developing a method for making paper while camping currently. Camping Papermaking! 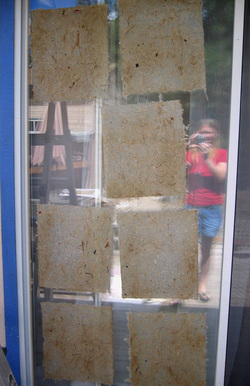 This is my low tech way of drying my handmade paper. The glass allows the paper to have one very smooth side and one more "natural" side. This particular paper is made from gampi. After the paper has been pressed, it looks like this. Email me for more specific info and prices.